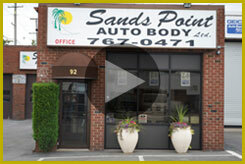 We are extremely proud of the work that we do here at Sands Point Auto Body. We have undertaken the painstaking task of searching the auto repair industry to employ ONLY the most highly trained, skilled and talented craftsmen in the industry. We are so confident in our repairs that we guarantee our work for the life of your vehicle. So whether you want to restore your valuable classic, touch-up your present vehicle, of if you require services after an accident, we can meet all your needs. We invite you to come in, look over our shop, view our credentials, and familiarize yourself with some of the company we keep and the satisfied friends we have made along the way. When you leave our shop, you will be as confident in our repairs as we are.